What an incredible weekend of racing in the stunning English Lakes. The Montane UTLD 100 and 50 mile races certainly have become two of ‘the’ must do events on the 2014 calendar. With the long term continued sponsorship of UK brand, Montane. The event has grown from very humble beginnings as an alternative to UTMB to an outright ‘must-do’ for any enthusiastic ultra runner. Although run on the same course, the 100 and 50 events are two very different beasts. Both races are point-to-point. The 100 starts in Coniston and does a circular route around the northern lakes dropping back down from Pooley Bridge towards Windermere and then heads around Windemere Lake via Ambleside taking in the Langdale Valley and then a push over Tilberthwaite concludes what is unanimously called a ‘brutal’ event. Not surprisingly, the ’50’ starts pretty much halfway around the 100 route, in Dalemain and is run over the exact same course as the latter half of the 100 event. Sun and the Lakes can be a rare commodity but participants in both events had plenty of relentless heat to partner them over every step. Even during the first night, temperatures were ridiculously balmy with nothing more than a short sleeved shirt required. 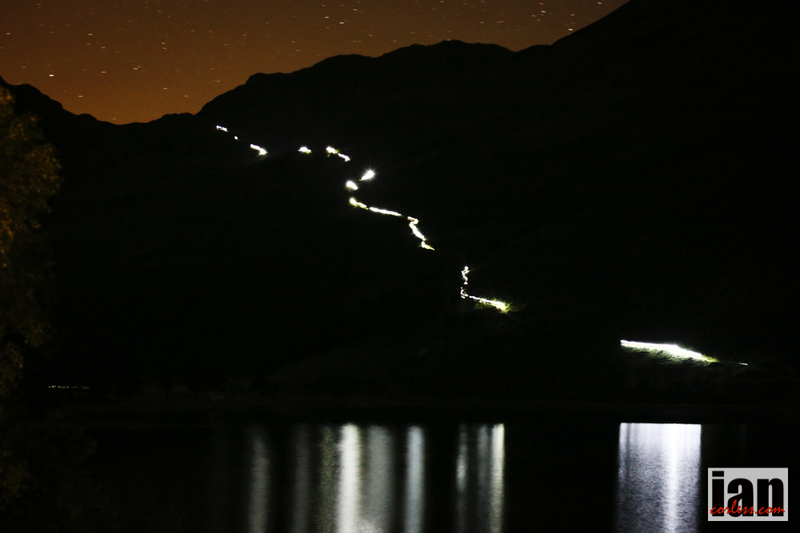 The second night however did throw a curve ball for 100 runners entering another night on the trails or for 50 runners finishing after 2100 hours. The heavens opened with some biblical rain… I guess for some it was a welcome cool down and refresher from the oppressive heat. Marco Consani (21:14:52) was very much a dominant force in the 100 event. Over the early stages Marco had close competition and ran side-by-side with eventual 2nd place, Charlie Sharpe. However, when Marco took over the lead he never looked back. Climbing out of Howtown with the start of a new day he had a 30-minute lead which he continued to extend all the way to the line finishing almost 90-minutes ahead of Sharpe in 2nd (22:47:56). Lee Knight finished 3rd, 23:21:48 after pushing relentlessly for the duration of the event. In the ladies race, Beth Pascall proved to be a revelation. Having never run longer than 60-miles before, this lady started at the front of the race and at Buttermere one wondered if she would pull off something quite special. However, experienced ultra runner and Montane athlete, Debbie Martin Consani (yes, Marco’s wife) slowly pulled back the gap and extended the lead away from Beth. Apart from a rough patch at Mardale Head, Debbie never looked in doubt of winning the race but Beth really was charging and at the line it was 25:28:33 to 25:48:36. Impressive. Nicky Taylor was 3rd lady in 29:37:08. One thing must be said, the Lakeland 100 is a tough event. Even contemplating the start and the race deserves respect. Each and every runner who toed the line achieved a great deal. For those who finished, they have memories and experiences to take to the grave. For those who didn’t finish, they will be back… the UTLD100 get a hold like no other race. The Lakeland 50 was a British Championship event and as such competition was higher than normal. The men’s race had Lakeland 100 winner and Montane athletes, Stuart Mills and Iznik and Spine Challenger winner, Marcus Scotney. In addition, we had Danny Kendall who just this year placed top-5 at the Marathon des Sables. Add to the mix, Kim Collison, and Lee Kemp a fast race was always on the cards. Fast it was… maybe too fast! Starting at 1130am, the heat of the day was already pushing down and when Danny Kendall says ‘it’s too hot!’ then you know it’s hot… In the early stages, a small group formed but it was Collinson who eventually snapped the elastic. Scotney came from behind and charged into 2nd place and then behind, Kendall and Mills had a tough battle for 3rd. At the line, Collinson finished in 7:48:01, Scotney 2nd in 8:06:42 and Kendall 3rd in 8:13:39. The ladies race had Lakeland 50 course record holder, Tracy Dean racing against the female Lakeland 100 course record holder, Lizzie Wraith. For sure, it was an exciting head-to-head. However, add to the mix Jo Meek and a real battle was always going to unfold. Meek as expected pushed ahead of Wraith and Dean and never looked back. Running with 100% conviction, Meek dominated the race and never for a moment looked under threat. Dean unfortunately dropped due to illness leaving the door open for Wraith to take 2nd place and Bonnie Van Wilgenberg ran a controlled and impressive race for 3rd. Meeks run was so impressive that she placed 6th overall in a time of 8:43:14. Wraith ran 9:18:22 and Wilgenberg completed the top-3 in 9:31:05. This entry was posted in Uncategorized and tagged 100 miles, 50-miles, British Ultra Trail Championships, Debbie Martin Consani, Endurancestore, IanCorless, jo meek, Kim Collinson, laithwaite, Lakeland, Lakes, marc, Marco Consani, Montane, montane utld 100, montaneutld100, mountains trails, Running, sportident, Talk Ultra, trail, UK athletics, Ultra, UTLD, UTLD100, UTLD50 by talkultra. Bookmark the permalink.